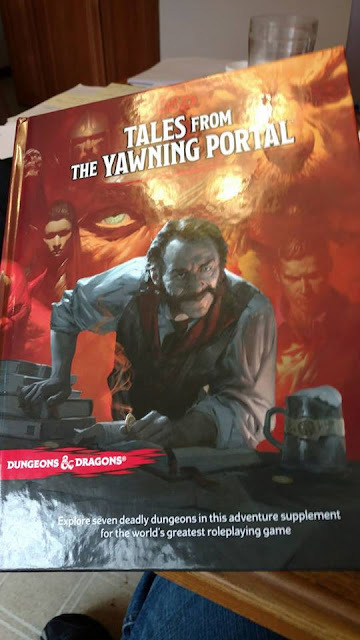 Grabbed the Tales from the Yawning Portal today. It's a lot of fun. A lot of great adventures updated for 5e. It has another version of the Tomb of Horrors. Noticed that there wasn't the slightest complaint like there was when the 4e version came out. I am looking forward to running G3 here soon using these conversions vs. my own. There are also a few Forgotten Realms adventures I am looking forward to trying out. I will be at Gary Con tomorrow. Look for me, I'll be the middle-aged gamer with glasses and a goatee. Er...wait. I'll also be wearing a Games Plus 35th Anniversary shirt.